Icons: "Golden: Dutch and Flemish Masterworks..."
This brief article, pegged to an exhibition, updates a longer story I wrote for The Art Newspaper in 2009 headlined "The Most Important Collectors You've Never Heard Of." Rose-Marie and Eijk van Otterloo started by buying horse buggies. When they'd filled their New England barn, the couple -- he is Dutch and she is Belgian -- began to collect English sporting prints. Then they met Old Masters specialist Peter C. Sutton, who suggested a different direction —buying the artists of their heritage, which, he says, "they hadn't realized they had the wherewithal to buy." Thirty-five years later, the van Otterloos have amassed one of the world's best private collections of Old Master paintings, valued at $250 million to $350 million. The artists include Rembrandt, Frans Hals, Jan Brueghel the Elder, Aelbert Cuyp and Jacob van Ruisdale. In "Golden: Dutch and Flemish Masterworks" from the van Otterloo collection, all 70 paintings will go on view Feb. 26 at the Peabody Essex Museum in Salem, Mass., the city outside Boston once famed for its witch trials. At first, the van Otterloos bought what they liked. But after they had purchased about 25 pictures, they asked Simon Levie, a former head of the Rijksmuseum in Amsterdam, to evaluate their collection. He noted that they owned mostly landscapes and steered them toward the systematic pursuit of major works, by the best artists, in all genres of Holland's 17th-century Golden Age. They also wanted only the best paintings -- waiting for years to find a Rembrandt, for example. Then, when the masterly "Portrait of Aeltje Uylenburgh, Aged 62" came on the market in 2001, they sold 18 paintings to pay its nearly $30 million price tag. Painted when Rembrandt was in his mid-20s, it depicts a minister's wife who was a friend of the artist's wife-to-be, Saskia, as well as a cousin of a prominent Amsterdam art dealer. The van Otterloos—he co-founded investment firm Grantham, Mayo, Van Otterloo & Co.—continue to collect. Just last month, they purchased a painting at Sotheby's that is also going into the exhibition. It's not just an addiction, says Mr. van Otterloo, "it's a discipline, too," as buyers need to keep to a focus and ignore the "many beautiful things" outside it. Their collection still has gaps, and the van Otterloos are looking for works by women artists and others like Pieter de Hooch. A smaller version of the exhibition opened in November at the Mauritshuis museum in The Hague, Netherlands. After the show closes June 19 in Salem, it will travel to the Fine Arts Museums of San Francisco and the Museum of Fine Arts in Houston. 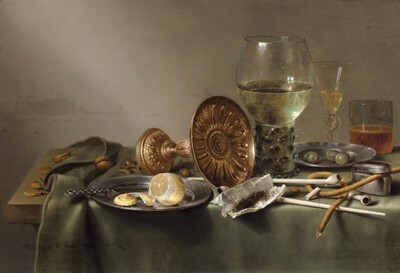 For the show, the van Otterloos also emptied their home in Marblehead, Mass., of their trove of 17th-century Dutch and Flemish furniture and decorative arts. They are, of course, looking for more. "It makes the atmosphere in our house so much better, together with our paintings," said the 73-year-old Mr. van Otterloo. "But there's not that much around." To which Mrs. van Otterloo, 65, added: "That makes the hunt more fun."